What good is a grill if it can’t sear? We hear it all the time: “Pellet grills can’t sear”. Well, that’s true in most cases, but Memphis Wood Fire Grills are different. Our grills come with two inserts: The first is the Indirect Insert, which is used to smoke, roast, bake, and hit high temperatures for searing without an open flame. The second insert is the Direct Flame Insert. 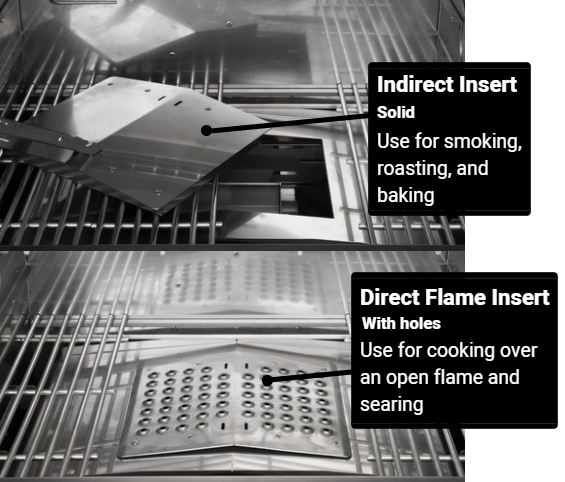 With the Direct Flame Insert in place, grillers can access Direct Flame Modes on their controller, which allows for cooking over an open flame at high temperatures that can’t be reached by most pellet grills. This is one of our favorite features, as it gives restaurant-quality searing capabilities. The Direct Flame Insert makes searing a steak simple and gives you the flexibility and versatility that you need from an all-in-one-grill. with the switch of an insert! Once the grill has reached 400°F, use the Genie Tool to set aside the center grill grates. Use your Genie Tool to remove the Indirect Insert. Caution: The insert will be hot. Set aside somewhere safe on a non-combustible surface, away from children and pets. Insert the Direct Flame Insert, ensuring that it is fully seated in the Flavorizer. Replace the grill grates that you set aside back to their place above the Insert. Press and hold the “up” arrow until temperature reaches the model’s highest set temperature, then press the “up” arrow again to access LOW, MED, and MAX Direct Flame Modes. Note: Advantage model has LOW and MED Direct Flame Modes, Pro and Elite models have LOW, MED, and MAX Direct Flame Modes. When cooking using the Direct Flame Insert on Direct Flame Settings, the hood should ALWAYS be in the open position. A closed hood during direct flame cooks may result in an Error-1 message. This error message means that the grill has reached too high of a temperature, causing the grill to shut down to avoid any damage to the unit. Never leave your grill unattended during a direct flame cook. 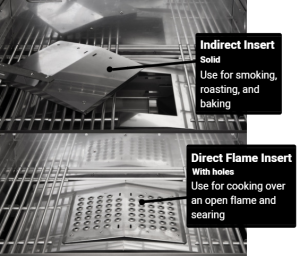 When the Direct Flame Insert is in place, the grill is only to be operated in Direct Flame Mode (LOW, MED, MAX), never at a set temperature (180°F-700°F). The grill is never to be operated in Direct Flame Mode while the Indirect Insert is in place. While operating the grill in Direct Flame Mode, the grill temperature will not be displayed on your controller and the Food Probe will be in Read Only Mode.